Students belonging to the rural area have been given special weightage in the selection criteria. In case there is tie between the selected candidates, the younger candidates will be given priority. A few seats are left for the programme and the interested students can register online with the link given below from 25 March 2019 (1800 hrs) to 03 April 2019 (1800 hrs). The list of the provisionally selected candidates from each state will be announced on 06 April 2019. The provisionally selected candidates will be requested to send the attested copies of the relevant certificates through E-mail. After verifying the relevant certificates the final selection list will be published on 13 April 2019. The progamme is planned at 4 centres of ISRO during the second half of May 2019. 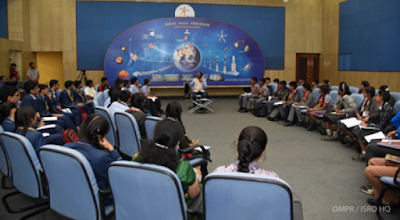 The selected students will be accommodated in ISRO guest houses/hostels. Expenditure towards the travel of student (II AC fare by train from nearest Rly Station to the reporting centre and back), course material, lodging and boarding etc., during the entire course will be borne by ISRO. II AC fare will also be provided to one guardian/parent for drop and pick up of student from the reporting centre.